Tom Clancy’s The Division 2 just got a new update titled Invasion Battle for D.C. that brought with it a bevy of new things. We have World Tier 5, with a new gear score cap of 500, Heroic difficulty, three new gear sets, a new faction stronghold, and even weekly invaded missions. It is safe to say that today is a good day for fans of The Division 2. In the original The Division, gear sets would provide players with certain perk bonuses based off of how many of the gear pieces were equipped. If you only had one piece of the set, you would get a simple boost, but if you had the full set, you would get all of the perks for equipping it. Gear sets have been heavily requested in The Division 2, so players will no doubt be pleased to see their return. 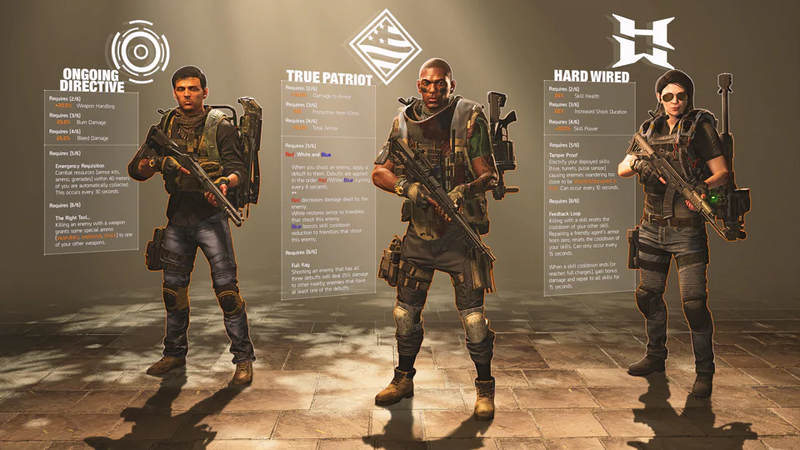 The three new gear sets are Ongoing Directive, True Patriot, and Hard Wired. Ongoing Directive will grant players an additional 20% to weapon handling with two pieces. With three pieces, you will deal 25% burn damage. Four pieces will let you deal 25% bleed damage. Having five pieces will grant you the Emergency Requisition perk, which will automatically pick up things like ammo, grenades and armor kits within 40 meters once every 30 seconds. When you have six pieces, you will acquire The Right Tool perk, which will give one of your other weapons elemental ammo when getting a kill. True Patriot will grant players an additional 10% damage to enemies’ armor with two pieces. If you have three pieces, you will gain 10% protection from Elites. Four gear pieces will give you an additional 10% to your total armor. Getting five pieces will grant you Red, White and Blue debuffs. Red will decrease enemy damage to players, White will restore your friends’ armor, and Blue will reduce skill cooldown times. If you get sx pieces of the set, the Full Flag effect will be applied to an enemy. When you shoot that enemy, it will pass 25% of the damage dealt to nearby enemies who have at least one status debuff applied. Hard Wired will grant players an additional 20% skill health if you happen to have two pieces equipped. If you have three pieces, shock duration will be increased by 20%, Four pieces will give you an additional 20% skill power. Once you have five pieces, you will gain the Tamper Proof perk which grants a shock ability to all of your deployed skills which can activate once every 10 seconds. When you get six pieces, you will gain the Feedback Loop perk. With this perk, anytime you get a kill using a skill, it will reduce the cooldown of another one of your skills. If you restore a teammate’s armor from zero, your skill’s cooldown will reset. (This can occur once every 15 seconds.) If your skill cooldown ends or recharges, you will gain the ability to deal bonus damage and repair with all skills for 15 seconds. The Black Tusks will have a chance of dropping the new gear set items in World Tier 5, so get out there and start farming!